For those who’ve just joined us. When I see a graphic like this I look at the current science that indicates that aerosols are cooling the earth between 0.5C and 1.4C at today's values and that these aerosols are currently keeping the Arctic between 2.5C and 5C cooler. I then consider what would happen if today all aerosols were removed and in the next 2 years we experience this jump in warming globally as well as the feedbacks associated with early September full Arctic sea ice loss and the carbon cycle-feedbacks that will ensue. It is a stepwise jump in the temp record that shoots up above the TCR value within 2 years shortly after 2025. NASA GISS is in for February! This was a "cool" month, only the sixth warmest on record with +0,78oC above the 1951-1980 average. Even February 1995 was as warm as this February was. Other February months that have been warmer are: 2016, 2017, 1998, 2015 and 2010. Given the "coolish" start of this year, I think we already now can be fairly sure that this year should end up being the fourth or fifth warmest yearon record behind 2016, 2017 and 2015. Yay, we have a hiatus! It will probably be a very short hiatus. I actually think that, with the dramatic peak in temps caused by the recent el Nino, global warming deniers will be talking about a hiatus for the next decade, just as they did after 1998. Also read my previous comment (in the quote) if you wish. If that should happen, there won't be much of an hiatus, and if it doesn't, what would cool down our atmosphere to create one? Volcanoes can do the trick for a while, but the oceans have more to offer and that's where more than 90% of the heat is going. Adding annual ocean heat content for the top 700 metres (or 2,300 feet) for year 2000, and 2017, below. I see what you did there. Nice little twist in order to make a subtle argument that the high temps of the recent el Nino or the 3 Nor'Easters in the last 2 weeks are no big deal. The simple fact is you are consistently downplaying the reality of AGW and its effects. You can see this behavior on threads all over this site. Please continue to do so but do not take offense when I choose to call you out. Go right ahead. I will do the same, if you try to claim certain extremes are a new norm, or other such nonsense. There is reality, and then there are those exaggerating the effects to the high or low side. A classic example is the Arctic sea ice. After the record low in 2012, Prof. Peter Wadhams predicted the Arctic would be ice-free in four years. After two years of increasing sea ice minima, Anthony Watts wrote in 2014 that Arctic sea ice is above normal. Anyone following the events of the Arctic know that both of these claims are absurd. If you (or anyone else) continues to claim that short-term events are anything but, I will call you out on them. After the record low in 2012, Prof. Peter Wadhams predicted the Arctic would be ice-free in four years. After two years of increasing sea ice minima, Anthony Watts wrote in 2014 that Arctic sea ice is above normal. Anyone following the events of the Arctic know that both of these claims are absurd. One of those claims follows the trend line in ice, and it is the expected outcome of a warming planet. The other is a lie in every sense of the word. One is absurd, the other one could come true. Wadhams predictions was 2016 +- 3 years. One is becoming more real everyday, the other one is more absurd everyday. Yet to you they are the same. Anyone following the events unfolding in the Arctic should be scared shitless. If your are not, you do not understand the magnitude of the changes. Fear is the appropriate and natural response to potential danger. Not fearing a real potential danger is a panicked response. Tell me, can you even bring yourself to admit that there is even a small chance that losing the Arctic be bad for humanity, or have you completely ruled out that possibility? Given the earth is 4.5 billion years old, this would be short term, right? Actually, both of those claims are equally absurd (therefore, yes they are the same). The decades-long trend line in Arctic sea ice minimum is flat, making either claim untrue. Extrapolating s short-term trend line in either case, while ignoring the long term is foolish. I have not ruled out that possibility, and consider it to be a major issue. However, convincing a majority of the people to think similarly requires accurate and honest reporting of the situation. Making exaggerated claims that do not materialize is no way to convince the masses. They will view them both in the same light. Is that what you want? Excuse me? The trend is very clearly going down in both extent and volume. I have no clue how you can claim that. Jeez man look around you. Everyone here is aware of the trend. You are only deceiving yourself with that one. Honest reporting? The Honest reporting should be that virtually all indicators (Air temps, ocean temps, sea ice, jet streams behavior, rate of extreme weather events, etc.) point towards significant changes all over the earth. The consequences are uncertain, but the assumption should be that it's going to be bad. There is no way of saying that without it sounding scary. That's a big problem because extraordinary claims require extraordinary evidence. Scientists and serious people in general would be naturally skeptic of the claim because it is extraordinary. The thing is, there is extraordinary evidence to support the claim. Climate change is real. It is happening. Chances are it will be very bad. Making exaggerated claims that do not materialize is no way to convince the masses. They will view them both in the same light. Exaggerated claims? I wish. The mass extinction is real. The loss of sea ice and trend of the sea ice is real. The rise in temperatures is real. The rise in extreme weather is real. The lack of seriousness from the authorities to tackle climate change is real. What I want is for everyone to see the threat of climate change as the largest threat ever faced by modern humans, with the capacity to end everything that is good in our world. That way people with the right stuff will look at potential vulnerabilities and find solutions. If the right people think there is no danger until 2100, they will ignore the danger and we'll face climate change without the ultimate human ability, planing. The right people are too busy doing great things in life to take the time necesary to examine the extraordinary evidence. That's why the risk must be acknowledged at every turn and should never be hidden under comfortable versions of the truth. People need to know so they can prepare. Take for example Wadham's prediction, which was 2016,+-3 years. Strictly speaking, that prediction is still correct. Chances are it will be wrong given the conditions right now, but there is a small chance it will be right. Even if it is not, given arctic conditions and expected temperatures over the next decade, the chances the sea ice collapse increase every year. Wadhams prediction is much closer to the truth than IPCC predictions. Does that trend go anywhere near zero by 2016? No. That is why most scientists claim that it will be at least 40 years before we become ice-free. That is if you use the overly pessimistic linear trend. The most recent trend has leveled off over the past decade to a negligibly positive trend. The Arctic has lost that ice which melted most easily. The rest resides in colder water and closer to land. It will not melt so easily. Hence, 40 years is probably too soon. I don't have qualifications to comment in any detail but It looks to me the bolded quote above doesn't fit with this curve as the linear trend (over a period longer than a decade) would be overly optimistic rather than pessimistic. Is there any good reason to exclude the known history and limit this to the last decade? Does that trend go anywhere near zero by 2016? No. Why would it? It's 2018. That is why most scientists claim that it will be at least 40 years before we become ice-free. I don't know that is true anymore. Every year that goes by must grow the concerns of anyone observing the ice. I can certainly agree that was the consensus 11 years ago. 20 years ago suggesting something like an ice free arctic before 2070 was downright heresy for very good reasons. Yet here we are, with record low maximum, for third year in a row (That might change tomorrow, we'll see). That is if you use the overly pessimistic linear trend. The most recent trend has leveled off over the past decade to a negligibly positive trend. The Arctic has lost that ice which melted most easily. Yes, but at the same time the Arctic is warming much faster than anywhere else in the world by a lot. The rest resides in colder water and closer to land. It will not melt so easily. Hence, 40 years is probably too soon. The linear trend of the whole data set is the least biased possible metric. That doesn't mean it is the best, but it is the starting point of all speculation. That one gives us until 2031. That's 16 years. Since we expect to globe to keep warming, the Arctic to warm faster pace than the globe, the jet streams to lose even more coherance and the oceans to keep warming, I think that 16 years seems like too much. True that the quote doesn’t fit that curve. However, that curve is for Arctic sea ice maxima. The quote was concerning sea ice minima. Hence, it is not comparable. 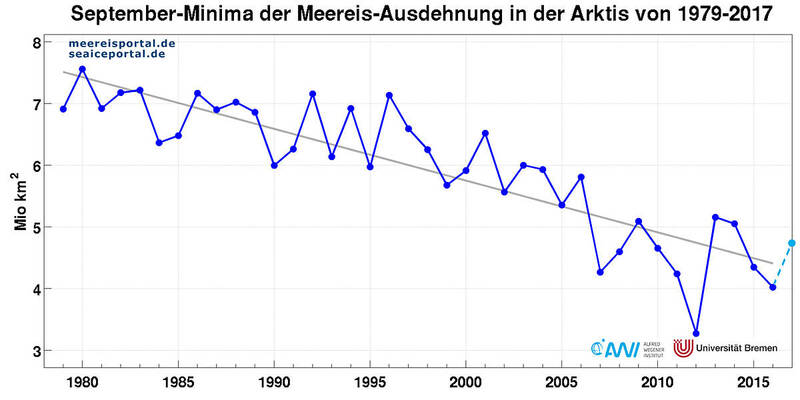 The comment about the most recent decade was to counter Peter Wadhans claims which neglected to include the first decade of the past 40 years, when claiming that the Artic would be ice-free by 2016. The linear trend in minimal sea ice occurred over the middle half of those 40 years, but not the beginning or end decades. So now we have another hiatus, of arctic sea ice. Great. I'll avoid feeding this one. That's usually the best option, oren. Older ice dropped to just 0.9% of the ice pack last March, the lowest winter maximum ice extent in the satellite record also occured last March and the ten lowest September extents have occurred in the last 11 years. But since this is the Global Surface Air Temperature thread, it's probaly easier to opine about Arctic Sea Ice hiatus here. ....especially as there is a thread entitled "Ice-free Arctic". Tut tut, Daniel, Archimid et al. We went from 17 000 km3 to 4 500 km3 in less than 40 years. So how can somebody come to the conclusion that it will take more than 40 years to lose that 4 500 km3 ? And it's in the last few years the earth warmed most. So i think that ice can be gone any moment. True, we have gotten a little OT here. However, that was just one of the examples listed about exaggerating effects. They have consequences. We do not want to labeled as the scientists who cry wolf (probably too late). Jim Hansen stated that this was a necessity 20 years ago, as the effects would be too far off to concern the average American. I disagreed with him then, and I disagree now. If we continue to make exaggerated claims, that fail to materialize, how will anyone take us seriously, when the concerns are imminent? If we continue to make exaggerated claims, that fail to materialize, how will anyone take us seriously, when the concerns are imminent? It is way worse to hide the risk because of reputation concerns. The risk of climate change is real and imminent. This is a life and death matter and should be treated as such. That means, prepare for the worst. But how can you prepare for the worst if you don't know what it is? By conjuring possible and likely scenarios and preparing for those. If they don't happen, great. If they do, we are ready. This is indeed OT. My apologies but the Wadhams/Watts comparison was just too much to let go. I'll shut up now. I have no problem conjuring possible or likely scenarios. My issue was more connected to when. Claiming that a particular consequence that is likely to occur 50-100 years into the future could happen in the next five years does a disservice to those working in the field. That is not hiding the risk. Rather, it is more accurately portraying the timing of the risk. That is where we are losing the general populace. Please, no concern trolling ('we', 'us', 'our') and on-topic from now on. Jim Hansen stated that this was a necessity 20 years ago, as the effects would be too far off to concern the average American. I disagreed with him then, and I disagree now. Hansen was right 20 years ago and is even more right now. You were wrong then and even more wrong now. Your wrongness is already costing lives. I hope that when climate change finally hits you (and it will) you can accept your part in disaster and live forever in shame. However, given your current denial of reality, it is likely that you will convince yourself you had no part in it. I can only hope these words haunts you. Sorry, but I will stick to my guns that exaggeration in order to convince others is not a good practice. Once people realize this, all credibility is lost. Obviously, you think this is the right practice. I'm not exaggerating, but you are. In the linked thread I prove it and you admit it. Please take the rest of the discussion there. This is OT and we've been warned. I can feel Neven's patience wearing thin all the way from here. Looking like another month of ~0.80°C on GISS for March or higher. Big warmup on NCEP reanalysis the last 7 days. If you account for the ENSO lag we should be seeing the impacts from December’s peak Niño 3.4 value of -1.04°C. Still no sign of regressing back to pre 2014-2016 values/trend. NASA GISS just reported that March 2018 was the sixth warmest on record with an anomaly at +0,89oC. However, the margin to the third warmest March from 2010 was small, just 0,03oC. To the seventh warmest March, occurred in 1990, the margin was quite large, 0,12oC. If no El Niño shows up later this year, I think it's fairly safe to assume that 2018 will be the fourth warmest year behind 2015-2017. Still no signs of GISS LOTI falling back to pre-super El Niño (2014-2016) levels/trend. The running 12-month mean has been above 40 year linear trend since early 2014. We have also been above the longterm linear trend since 1999. GISS March temps should reflect the 3-month lag of the peak of the La Niña. +0.89 C not much of a bottom. The post El Nino is not behaving that different than post 1998. 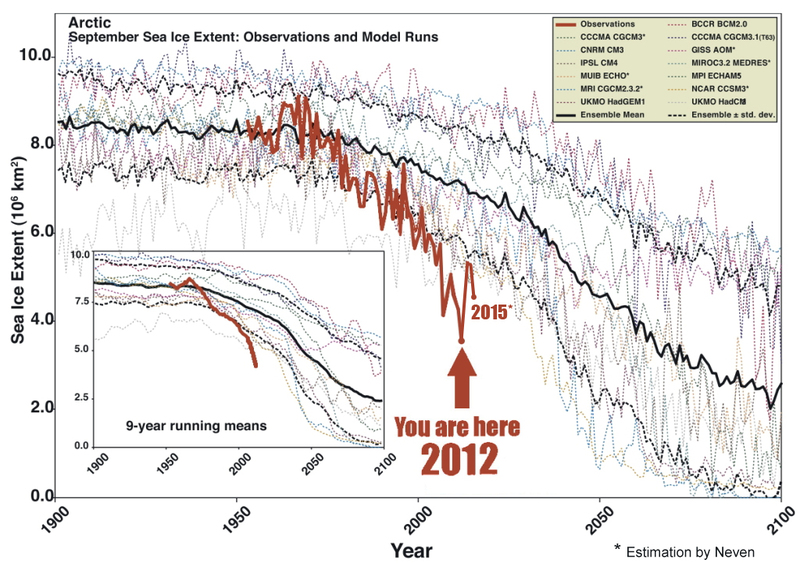 This will allow deniers to talk about the hiatus in warming over the next decade, just like they did after 1998. Meanwhile, we race towards a living hell. I actually do think it behaves differently. In 1999 it came back down to the prevous level pre-1998, while in 2017 and 2018 it did cool but is still far above the previous level. Obviously we’ve dropped down from the peak we saw in 2016 but not down to pre El Niño trend level. By this point in 2000 the running 12-month mean had already dropped down to below the 40-year linear trend. We have yet to do this now 2 years since the El Niño event faded in 2016. We have also had a weak & a moderate La Niña events. My point is that there was a step-up in warming rather than a brief warming peak. Agreed but the deniers will still latch onto this drop back and use it to argue that the science is wrong. Agreed - which is why on threads where we discuss the long-term, e.g. date of first day Arctic Sea Ice volume is less than 1,000 km3, in the back of my mind is that AGW is not going to stop for the forseeable future. The Paris Accord is insufficient and some Governments are resisting openly or covertly implementing CO2 reductions. Meanwhile it seems the chances are now more for an El Nino by the end of the year than La Nina or ENSO neutral. March on JMA came in at 3rd warmest. As Vader mentioned above, the margin on GISS between 2018 and 3rd warmest was close so this isn’t too surprising. Slight differences in how agencys perform analysis can bring these minor differences. More importantly it’s another month that’s well above the linear trend. Another warm month on the way. Still time to drop off some but currently on pace on NCEP reanalysis for the warmest month in 11 months. "An ingenious animation from Dana Nutticelli and skepticalscience.com illustrates how the long-term warming trend becomes much more clear-cut when El Niño and La Niña are factored out." Title: "State of the climate: Warm start to 2018 despite La Niña conditions"
Extract: "Overall, 2018 is on track to be the fourth warmest year on record after 2016, 2017, and 2015, but depending on how the rest of the year shapes up it could be as high as the second warmest, or as low as the 12th warmest." NCEP reanalysis puts April at warmest anomaly in at least the last 11 months. Wouldn't be shocked if GISS is back above +0.90°C. "Pakistan May Have Just Set a World Heat Record"
"Temperatures reported to have cracked 50.2 degrees Celsius (122.3 degrees Fahrenheit) on Monday in Nawabshah, located about 127 miles northeast of Karachi. If confirmed, that could make the measurement not just the hottest ever recorded for April in Pakistan, but the hottest ever reliably recorded for April anywhere on Earth..."
So I have been reading some comments over the past few months from poster Daniel B. stating that warming is limited to the nighttime rather than daytime temps, and that warming is limited to winter temps rather than summer temps. You are correct that an average may not correct reflect what is occurring around the globe. However, your extremes are a little off. Current temperature anomalies are resulting from warming winter temperatures, but little change in summer temperatures. We are not experiences more extremes. Rather, we are seeing milder temperatures overall, which are resulting in an average increase. Not when the average temperature increase is a direct result of increased nighttime temperatures. That does not change the potential for daytime heat waves at all. That is my point exactly! The increase in nighttime temperatures (while predicted by global warming theory), increases the average temperature, but does not affect the daytime temperature. Even your publication supports to my post about increased water vapor leading to an increase in nighttime temperatures, but not daytime. The increased cloudiness, due to higher humidity, is a temperature moderator. Not necessarily. Increases in clouds and water vapor tend to moderate the temperature, leading to increased overnight temperatures, while simultaneously decreasing daytime temperatures. This is particularly true in the agricultural regions, where they found a 4-8C decrease in midday temperatures during the summer growing season. I finally decided to refute these dubious claims using data, rather than just words pointing out the blatant untruth. This for the sake of innocent readers who might take these statements for facts if they remain unchallenged. To my help comes this paper from 2016, which uses weather data from 1960 to 2009, and focuses on the NH. The top half of Figure 1 contains the data. It shows how summertime temps warmed at ~60% of the rate of wintertime temps warming for both day (Tmax) and night (Tmin), and how daytime temps warmed at ~75% of the rate of nighttime warming for both winter and summer. The bottom line says of course there is warming in daytime, and in summer, and not just in winter and/or nighttime, an obvious result of warming driven by CO2 and other GHGs. The trends in the area‐weighted average of the (a) diurnal minimum and maximum temperature and (b) diurnal mean temperature and temperature range from a least‐squares best‐fit, with the associated 95% confidence interval, for global and northern hemisphere annual data, and for Winter (DJF) and Summer (JJA) means over the northern hemisphere for the period 1960–2009. Data are from the CRU high‐resolution gridded observations. Thank you also for supporting my claim that the sky is blue. Next time I'll try to word it unequivocally, so that it doesn't look like I'm trolling and wasting everyone's time. Maybe it's as simple as warming over our temperate latitudes means the atmosphere holds more moisture and so produces more cloud cover. Cloud cover will suppress daytime maximums but keep things nice and warm over night. If you could reverse the process and see less cloud then daytime max's would surely increase under full sun but nightimes would more readily radiate the heat away from the 2m level and so give colder nights? The odd time , here in the UK, that the clouds give way we do see excessive heat build up but this tends to be in spring or in autumn so absolute maximums ,which would occur over summer, do not get broken just the time of year records? We do also get the freak years here in the UK like 1976, 2003,2006 where we have ample sun and I think this year may turn into one of those? Lets just hope it does not seep up to the Arctic though!!! I want Daniel B.s magic powers that allows him to ignore statements like "The bottom line says of course there is warming in daytime, and in summer, and not just in winter and/or nighttime, an obvious result of warming driven by CO2 and other GHGs." My life would be much happier.